The most improved Halifax elementary school from 2008-09 to 2015-16, based on student scores, was St. Stephen’s Elementary, a small P-6 school with a stable enrolment of 200 students located in Halifax’s north end. 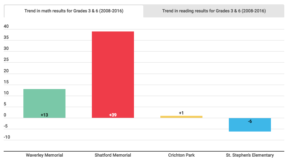 In 2008-09, 85 per cent of St. Stephen’s Grade 6 students met reading expectations; six years later everyone in the class made the grade. In the case of Grade 6 mathematics, St. Stephen’s student scores rose from 69 per cent to 89 per cent. Student success at St. Stephen’s Elementary is driven by a combination of factors — school climate, teaching and class composition. Demographic shifts and gentrification since 2005 have turned the neighbourhood into a preferred school attendance area for younger urban professionals with average household incomes hovering around $120,000. With the arrival of upwardly mobile residents, older, lower income residents have been displaced. 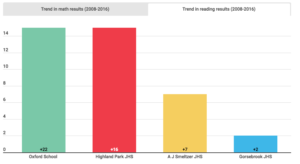 The changes in social composition accompanying gentrification also help explain improved scores at Highland Park JHS. A half-dozen or more Halifax elementary schools, in addition to St. Stephen’s, can be identified that show marked improvement in mathematics and reading. In grades 3 to 6 mathematics, the most improved schools were: Waverley Memorial (Waverley), Shatford Memorial (Hubbards), and Crichton Park (Dartmouth). A newer P-5 Lower Sackville school with 250 students, Smokey Drive Elementary, has produced better results in Grade 4 mathematics, judging from recent scores. 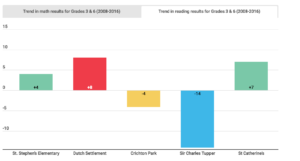 Aside from St. Stephen’s, the most improved in grades 3 to 6 reading were Dutch Settlement (Rural HRM) and St. Catherine’s (Early French Immersion, Halifax West). Students at Dartmouth’s Crichton Park School achieved sound results in both mathematics and reading. Nine of Halifax region’s 36 junior high-level programs are trending toward improvement in either reading or mathematics. One south-end Halifax school that was underperforming in 2008-09 was Gorsebrook Junior High. Since then, student achievement levels have rebounded in both Grade 8 mathematics (+12) and Grade 8 reading (+ 2). 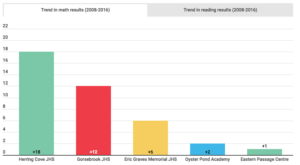 From 2008-09 to 2015-16, Grade 8 reading scores at Oxford School rose dramatically from a low of 54 per cent meeting the standard to 76 per cent, eight years later. In north-end Halifax, reading scores also rose 16 points at Highland Park Junior High, located not far from its fast-improving feeder school, St. Stephen’s. Less dramatic improvements were also registered by Grade 8 students at A.J. Smeltzer (Lower Sackville) as well as at Gorsebrook Junior High. Signs of school improvement can be found, in various places, in Halifax Region high schools. 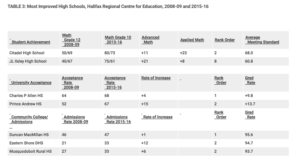 Surveying all 15 Halifax Regional high schools, based upon published HRSB data, a number of positive trends come into sharper relief. Mining the accessible data, it is possible to identify the most promising signs in five different domains: academic achievement, university admissions, community college acceptances, guidance services and preparation for the workplace. Two educational initiatives implemented in and around HRSB schools are having an impact. One city high school, Citadel High, has registered a significant improvement in its levels of student achievement in mathematics. Student scores in Grade 10 mathematics have risen significantly in both advanced and applied math since the 2009-10 introduction of the IB diploma program. The greatest overall improvement was registered by J.L. Ilsley High School (Spryfield), the school where a large proportion of Grade 10 students are enrolled in the after-school Pathways to Education homework and scholarship program. 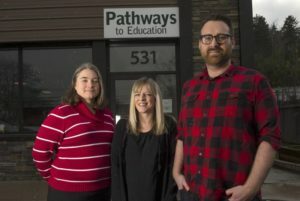 That program’s success in raising high school graduation rates in its Spryfield attendance zone from 54 per cent (2008-09) to 89 per cent (2015-16) is evident in the dramatic increase in mathematics scores.